KIEV, April 16. /TASS/. The election campaign staffs of presidential hopefuls Pyotr Poroshenko and Vladimir Zelensky have agreed to rent the Olympic National Sports Complex (Olympic Stadium) to hold debates on April 19, incumbent President Poroshenko’s campaign team chief Oleg Medvedev said at a briefing on Tuesday. Medvedev added that on Tuesday evening the election staffs should hold talks on the preparation for the debates. In particular, the debates program will be discussed. Earlier, Zelensky proposed that the debates should be held at the Olympic Stadium on April 19 at 19:00 local time and asked Poroshenko to take part in them. 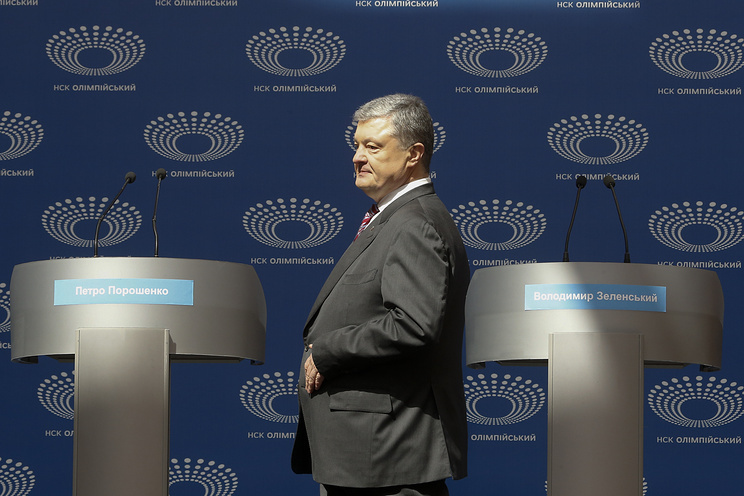 Poroshenko agreed, however suggested holding the debates on April 14, while on April 19 at 20:00 they will debate in the Public Television studio. Nevertheless, Zelensky continuously insisted on the initially proposed date and didn’t turn up at the event held last Sunday, on April 14. At the same time, his election campaign staff specified that the place for the debates is not determined by law, holding debates on live television is a condition for allocating budget funds to hold them. On Monday, Poroshenko’s election campaign staff put forward an initiative to hold the debates at the Stadium at 16:00 until 18:00 and later debate in the Public Television studio. The first round of Ukraine’s presidential elections took place on March 31. Zelensky received 30.24% of the votes, almost twice as much as Poroshenko who got 15.95%. The runoff is scheduled for April 21. Hey Buddy!, I found this information for you: "Zelensky, Poroshenko agreed to rent stadium for debates on April 19". Here is the website link: https://russophile.org/zelensky-poroshenko-agreed-to-rent-stadium-for-debates-on-april-19/. Thank you.